Truck drivers must be careful of having high blood pressure, as it can have a significant impact on a driving career. While drivers with high blood pressure can be cleared to drive, they may need to get recertified frequently and can be automatically disqualified from a trucking career if it gets too high. Continue reading to learn more about the effects of high blood pressure and tips for how truckers can manage it. Drivers with stage one and two hypertension can be medically certified to drive, but once they reach stage three, they will be immediately disqualified from driving. Stage one hypertension is when blood pressure is between 140/90 and 150/99, and stage two is when blood pressure reaches 160/100 to 179/109. Drivers with stage one hypertension can be medically certified for one year instead of two, and much have a blood pressure of 140/90 or below to pass the recertification. Also, drivers with stage two hypertension can only be issued a three-month certification and must bring their blood pressure down to under 140/90 to receive the rest of the 12-month certification. However, if drivers reach a blood pressure of 180/110 or above, they will be immediately disqualified from driving. If they lower their blood pressure to under 140/90 by a follow-up visit, they may be issued a six-month certificate and will be required to recertify every six months. These rules about blood pressure are in place for a reason, as driving with high blood pressure can be very dangerous. High blood pressure affects health in numerous ways, including a higher risk for heart disease, damage to arteries, increased risk of an aneurysm, poor blood circulation, and eye damage. 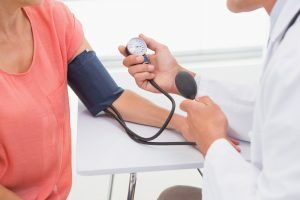 Drivers with high blood pressure present a serious risk for themselves and others on the road, which is why the trucking industry has rules in place for truckers with hypertension to be certified so frequently. Truckers are at a higher risk for high blood pressure because they spend the majority of their days sitting for long hauls. It’s crucial for your body to get as much movement throughout the day as possible, as sitting for hours puts too much pressure on your heart to pump blood to your entire body. Getting in as much exercise as possible in your downtime and eating healthier are both crucial aspects of lowering high blood pressure. This entry was posted on Friday, August 24th, 2018 at 3:04 pm	and is filed under Trucking Industry. You can follow any responses to this entry through the RSS 2.0 feed. Both comments and pings are currently closed.